With more than 300 color illustrations, many of which are new, the second edition of this bestseller adds material on such topics as mapping technology and expands on previous work. 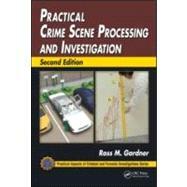 Presenting numerous case studies from his personal files and using methods based on U.S. Army techniques, the author expands the chapters on basic and advanced techniques to incorporate the latest trends in collection and interpretation. In addition, he offers a new laboratory manual and workbook. The collection of biological evidence has also been greatly revised to take into account the latest in DNA. The text features a new chapter addressing the body as a crime scene.